Today’s vehicles are more complex than ever, and not just anyone can repair them. We, at Martino’s Auto Center, have made investments in training and diagnostic test equipment to ensure that your vehicle is properly diagnosed and efficiently repaired. Whichever it is, we guarantee the best quality service done right, the first time–in keeping with our tradition of excellence. For any and all of the following maintenance and repair topics, contact us today! Martino’s Auto Center has been providing quality car care in Doylestown, PA since 1975. We are a family owned & operated business delivering honest and professional auto repair and maintenance services. The quality ASE certified Doylestown auto repair technicians at Martino’s Auto Center use the latest automotive technology and are equipped to handle all major and minor repairs on foreign and domestic vehicles. We understand your vehicle is a major investment which is why we care for each customer’s vehicle as if it were our own. Our exceptional customer service reminds people of the personal touch which many people think has been forgotten in today’s “Big” business practices. If your car breaks down, we offer towing services so we can help you get back on the road safely. As an independently owned Doylestown auto repair shop, we are also able to provide custom exhaust options. 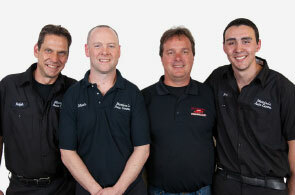 Please stop by or call and speak to one of our expert exhaust technicians.